I knew you would enjoy the place. Kayaks and canoes are a terrific option but, also consider renting a boat. It usually cost less than 140 $ per day. When I lived there I bought a boat just so I could always go to the river, whenever. Upon hindsight, renting would have been a much cheaper alternative. That old model T has been there for a long time. My son and me carried out some of the pieces for the trashman. Many times while there I saw people hike with in a few hundred yards of the river then go back up hill without even seeing the river. It always amazes me. It sounds like that is what you did. As for the river permits the number is set by law. It is for homeland security. They want to keep track of everyone to keep them from blowing up these vital resoures. Of course ! May my tax dollars help them. It also helps the search and rescue folks. 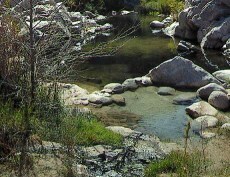 While on the river do not forget to stop at Ringbolt/Arizona hot springs. With a charged up battery. There are many other wonderful and terrific places to discover on the river too. I will just let you have fun finding them. As a side result I hope you get to know your date as good or better than the canyon/river. My son still lives in Vegas. When I go to visit him I will visit this great place too.